Your goal is to generate sufficient income during your retirement for you to live on and your capital will also need to accommodate events such as medical procedures. In this statement, there is no mention of the word pension. “Pensions” can and do form a useful source of income but when looking at your planning, a more rounded approach will be needed. This is particularly so in the light of the pension issues discussed above. I note that all the proposed solutions for problems in pensions in the sections above are good for the Government or the Company but at a cost to the individual. My experience also shows that people try to simplify their affairs by looking at each type of product in isolation. This leads to poor decision making, bad risk management and accidental duplication of the same asset classes. Planning your investment strategy, to be done in a coherent manner, will require consideration of your total wealth as a whole. Planned Expenditure Gifts to children, cruise, or space travel, vintage car, etc. Do you already have income? Do you have a company pension or has your state pension already started and is therefore more likely to be unaffected by changes in future pension policies? Is there any increase in this pension value in line with inflation? Calculate how much income you still need to find now. Much of this work comes from the “Retirement Spending: Choosing a Sustainable Withdrawal rate” by professors Cooley, Hubbard and Walz.i The study and follow up study by other academics and wealth management practitioners shows that withdrawing 4% pa from a balance portfolio can generally be considered to be sustainable, with a small amount of capital growth left in the portfolio so that the portfolio also grows in line with inflation. There are limitations to the modelling which are relevant to a low growth, low inflation environment but over a 30 year retirement this study provides a useful benchmark. So how do we build income producing assets into the portfolio and can they do the job? What rate of dividends (dividend yields) are available and are they sustainable? What rate of interest (coupon) can you get on a bond fund and what risk comes with that type of bond? Is there a property fund with a good yield (rental income) and what is the occupancy rate that is providing that level of rent? Note with all these questions there is a part two to the question. Do not just buy on the rate; understand how it is generated. Remember, you are looking for income not just for this month, this quarter or this year. Your income will probably have to last you 25 or 30 years and so you need to ask your adviser this follow up question, not just buy on the headline rate. Don’t measure your income against bank interest rates. You need to understand that real rates of interest are bank interest rates minus inflation. During many periods the bank rate is similar or lower than inflation. 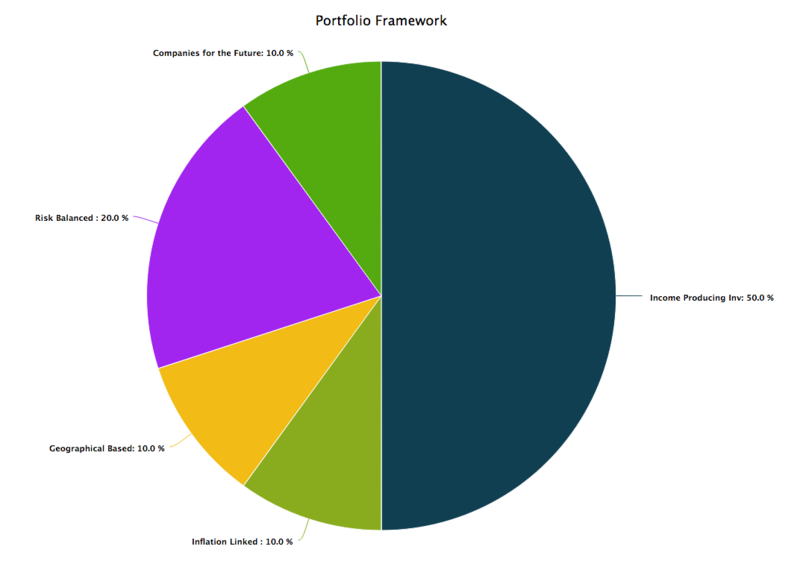 A portfolio framework into which you slot your assets for an “Increasing income in line with inflation” portfolio could typically look like this. This framework is to help with guiding your thought process and is not a personal recommendation. Your personal situation and your attitude to risk must be taken into account before investing. Of course, the two critical issues associated with any wealth planning strategy is that you understand the level of risk associated with an investment and that you offset risk in one investment with a diverse portfolio. Start planning income producing assets into your wealth during the five years or so that proceed your anticipated retirement. In this transition to retirement you should consider the balance of income producing assets versus the growth assets that you have been previously investing in during the accumulation stage of your planning. Of particular value is looking for opportunities to book profit on growth investments so that you will have a more certain idea of how much money you will have in your pot to generate income. As an economic cycle may not match the transition period to retirement, at times, it is perfectly acceptable to book profits and wait for the economic cycle to catch up before investing in the income producing assets. Look for multiple sources of income. Remember, you will be dependent on income for a very long time. As an example of over dependency on one asset class it is instructive to look at the experience of property in Spain. In Spain, there are still 1.4 Million homes unoccupied after the construction boom and following economic crisis. Except in Barcelona and Madrid, the market forces of renting out a property when there are so many places empty do not assist a landlord. Add to this the migration of young professionals to other countries and the return of 600,000 people to South America, which reduces the demand. Also, OECD figures estimate that the price of Spanish property is 37.5% below its high in real terms too. This “building wealth ahead of retirement” section is a short section. However, it has been included because in any family we have to help the children learn how to manage their wealth, in part so they are better prepared to manage anything we may leave to them on our passing. In the building wealth ahead of retirement section of life, the first principle is to understand that it is what you put away into your investments is as of much importance as the amount of investment growth. Spending all, or more, than you earn is not a viable strategy. This is all the more so in the context of the information above on Government pensions. If you are in this stage of life, Budget! Have money moved into your investment every month before you can spend it. Then invest it for the longer term. Salary bonuses and bequests are a useful way to boost your capital. Start as soon as you can as the effect of compound interest gets better the longer you hold the investment. Take an interest in how people and companies run their businesses. There is a huge amount of information published daily across the World about businesses and markets. With markets, today’s article is often contradicted by tomorrow’s article. Watching in real life how people run their business will give you much better insight into what is important for different types of business. This will make you better at making investment decisions in the future. Look for opportunities to pay your tax at the end of your investment period. The benefit of having your income and gain taxed at the end of your investment period is that you get growth on the whole investment. And next year you will get growth on the growth and tax that you did not pay last year. And so on, meaning a better return to you as an investor. This “gross roll up” on an investment makes a difference to your end result: The longer you have the investment in a gross roll up vehicle the better. Different investments have different tax treatments. As long as you are not giving up too much flexibility in how you manage your investments, try to use the most tax efficient vehicles. The choice will vary depending on your country and your own personal circumstances. Take appropriate advice if you are unsure of the tax status of an investment. After many, many years of advising clients I am convinced that keeping things as simple as possible is a good approach to adopt when planning your wealth management. Keeping it simple is especially true in the tax planning!! For many people, they have to consider Inheritance Tax. What planning you can do to help your spouse, children and grandchildren depends initially on the rules of the country where you and your beneficiaries live. As the rules are different for different countries, and as this is a specialist area of planning, you should work with a suitably qualified professional. A particular mention for British people is the additional tax relating to pensions. Known as the Lifetime Allowance (LTA) this is a restriction on how much you can have in your pensions. It is not scheme or plan specific but relates to all the pensions you have accrued, be that a combination of company pensions and personal pensions, or just one or the other. The maximum you can have in your pension pot at retirement is now £1 Millioni. The pensions are tested against the LTA whenever there is a “crystallisation event”. The UK HMRC has 11 events that trigger a calculation including death or reaching age 75. The age 75 calculation in particular is problematic. Do not get caught by thinking that you were under the limit at retirement and so you are now safe. You are not until after the final crystallisation event, at which point all your pensions are totalled and compared against the LTA. This final event is likely to be your 75th birthday. For any monies over the LTA, the tax rate is 55% of the amount over the LTA. Younger people also need to be aware of the LTA. My calculations show that a person age 40 with a pension pot of just £247,500 will exceed the LTA at age 65, even if she or he is not making further contributions. A 50 year old with £438,000 in their pension will have the same problem. The established norms of state pension provision and company pensions will be challenged due to ageing populations. Likewise buy and hold strategies have been less than effective over the last twenty years than in the previous twenty years. Active management will need to be part of the investment process. Portfolios need to take into account the vast number of technological changes that are coming in the next few years and position portfolios accordingly. To do this will need specialist managers to assist; managers who understand the technical issues as well as the new business models. People who approach their wealth planning in this way will have more choices and be more empowered. There needs to be an acknowledgement of the fact that retirement may last 30 years and planning tailored accordingly. Tax will continue to have an impact on the ability to provide oneself with investment income and on the ability to pass on wealth to the next generation.